Did you run out of petrol? Last week the UK government announced a “possible” fuel tanker drivers strike! This led to fuel stations across the UK packed full of panicked buyers over spending on fuel, filling their car up with fuel they don’t really need. 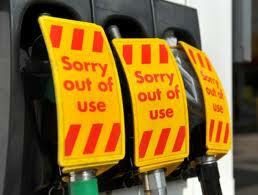 Demand for petrol rose 172% on Thursday, and diesel by 77%, according to independent retailers’ group RMI Petrol. In our need to control our world, being able to choose is an important freedom. If something becomes scarce, we anticipate possible regret that we did not acquire it, and so we desire it more. This desire is increased further if we think that someone else might get it and hence gain social position that we might have had. In his book Cialdini tells a story of a salesman who always arranged for more than one interested buyer to arrive when he was showing a used car. The competition increased anxiety in both of them, and made the car seem much more attractive. As a recruitment business owner, you can use this principle to help you make more placements and earn more money. The scarcity principle is one that has been used by smart recruiters. When something appears to be scarce, as human beings we instinctively want it more. Even though we don’t really need it! Is there an honest — time sensitive offer— you can include in your sales and business communications? Perhaps when marketing a candidate. Psychologists have found that the reason that scarcity is such a powerful principle is because as humans we are motivated by two main factors: “To avoid pain” and “To gain pleasure.” Avoiding pain (fear of loss) – works better for creating action than the gaining of pleasure (an advantage or benefit). We’ve certainly seen what happens when a shortage is announced about a staple commodity. What happens… yes, everyone goes out and buys loads of petrol, thereby making the problem worse. Now here’s a strange observation from Robert Ciadini, if people manage to obtain the item that is scarce they will also believe that it’s better than if the item had been in plentiful supply. So how can you use that in your business? Do you always create scarcity in your communications to encourage your client to call you, email you and take some form of action? You better do it quick because if you don’t and your competitors do, what are the implications for you and your business? This entry was posted on Wednesday, April 4th, 2012 at 9:30 am and is filed under Uncategorized. You can follow any responses to this entry through the RSS 2.0 feed. You can leave a response, or trackback from your own site.